It will be an interesting experience now that I’m gluten free and need to pack all my own food rather than relying on eating at the van exchange points or a local restaurant. 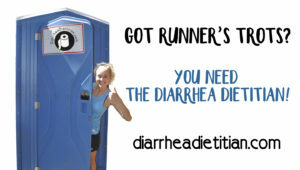 Unfortunately, many people struggle with diarrhea while running, also known as Runner’s Trots, so I have been writing a book on the subject. Now my book needs a good title. Make your suggestions on my Facebook page… you might win a prize!